"I'm getting my zeros mixed up." 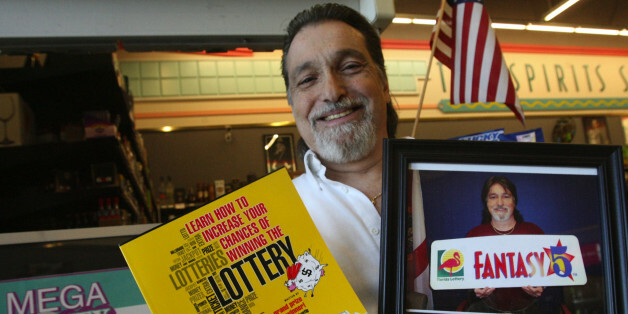 "To help change the world, the #lottery winner should become a GOP Presidential Candidate." At least he said he would do the same for her. A lucky Long Island man got a 2.9 million dollar surprise when he found a winning lotto ticket laying around in his truck, a month after he bought it. A large New Jersey shore family that suffered losses during Superstorm Sandy will share a $20 million lottery jackpot that one of the 17 siblings said would be "a great pick-me-up." Jimmy Kimmel Asks: What Would YOU Say To Your Boss If You Won The Lotto? Do Flowers Make You Rich? Flowers are healthy, they don't make false promises and they deliver nourishment to your soul. For the price of a fancy coffee drink, they will watch over you all week and remind you that no matter what your bank account says, you are rich. Will the Latest Powerball Winner Turn Into a Lottery Loser? The latest lottery winner overcame a 171 million-to-one shot to win the Powerball. He is going to need the same kind of luck to hang on to the money and keep it from destroying his life. When you think about it, almost all of us have our own "lotto moment." We make decisions about money that will either give us long-term security and happiness or bring on pain and regret. Why Do People Run Through Large Sums of Money Quickly? At first, I thought that the problem was people getting too much money too quickly. I assumed that controlling the flow of money, such as giving them monthly payments for a lifetime, would keep them in line. It's a little more complicated than that. If I won Mega Millions, I'd buy a $40 million house... with a $600 million wall to keep all you envious poor people out. You can see why bailouts fail. Wall Street and lottery winners have a common bond. They have access to easy money without restraints.